As strange as it seems to be looking ahead to autumn weddings in the summer, now is the time that wedding couples planning weddings in Lancashire later in the year are adding the finishing touches to their big day. An autumn wedding with its russet, orange and gold colours lends itself perfectly to introducing a warm, thanksgiving wedding style. The American celebration of gathering and feasting with families has extended across to the UK and fits perfectly with bringing your loved ones together on your wedding day. 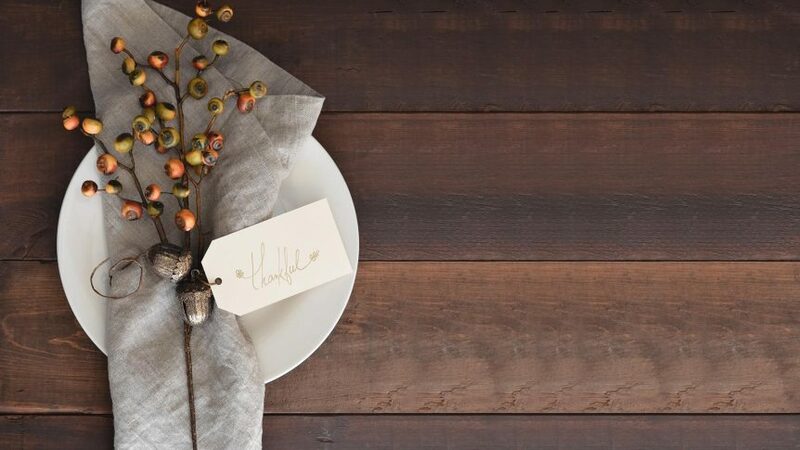 Get into the spirit – As Thanksgiving is a time to feast and catch-up with family and friends, with your thanksgiving wedding style think about introducing long rustic tables designed to allow guests to chat. Decorate them with pumpkins, bowls of seasonal vegetables, chunky candles sat on metal plates and piles of fresh fruits. Keep it personal – One of the important elements of Thanksgiving is about the friends and family you share it with. This appreciation of them all can be displayed on tables, where you can add individual touches with miniature jars of yellow, orange and black jelly beans. They can be finished off with a handwritten label with guest names tied around the jar and can be used as a place setting at the same time! Rich Hues – We’re lucky that the rich autumn hues abundant around Thanksgiving can be utilised throughout the wedding day. From deep reds to vivid orange and rich bronze colours offer warmth. This can be seen on table decorations and throughout the day with rustic seasonal red apples, berries and pine cones, with nuts, twigs, evergreens and late-season blooms like gerbera creating a stylish display. Lantern Light – lighting is so important at this time of the year. As the days are shorter and the nights creep in much earlier, you can create a romantic atmosphere with lots of lighting, candles and scents including spiced apple, cinnamon and pumpkin. Wedding venues in Lancashire vary greatly, so adapt the lighting to highlight any romantic elements – sweeping driveways, ornate staircases, gardens. Turkey and pumpkin pie – If you want to go all out then consider a roast turkey meal or go with a casual American diner buffet menu, including hot dogs, burger sliders, Coke float and milkshakes. The famous American pie is a must for any thanksgiving wedding style – with fillings including cherry, apple and pumpkin. You can serve these as individual, bite-sized treats to complement the carrot cake, cheesecakes and donuts! And don’t forget at the end of the night to give every guest a bespoke take-out box filled with seasonal home-made chutneys and jams.